Whether it’s theft, employee misconduct, safety violations, or other potential risks at your business, it’s wise to invest in business security. 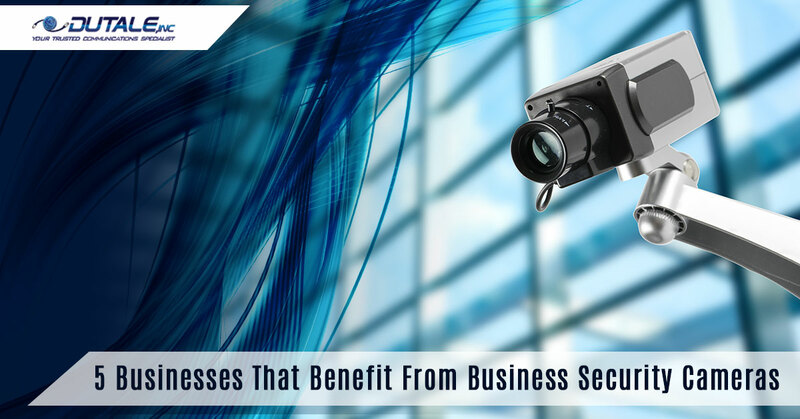 There are essential business security systems for every business out there, and some businesses can benefit from a video camera security system more than others can. In today’s blog, we’re going to discuss five different businesses that should look into installing business security cameras onsite. If, after reading this blog, you have questions about how business security could benefit your business, if your business should install camera systems, or how much an LTS security camera system would cost, contact Dutale Inc. in Moreno Valley and let us help your business. Get a free quote today. Check out our other blog on how restaurants can benefit from business security cameras to learn more about this in-depth, but there are four main ways that we see the benefit. A video camera security system can document food safety violations, “dine and dash” incidents, problems with future employees, or indecency in your restaurant. All of this can help document the offense and take action. In an office, a business security camera can help to resolve conflicts and improve productivity. If you have evidence of theft, time fraud, or an employee dispute, then your footage of the event can help to resolve the conflict. In addition to this, employees are more likely to be productive if they know a surveillance video recorder is actively monitoring the situation. If you want to reduce inventory shrink at your business, then commercial video surveillance is one of the best ways to make it happen. Whether you own a small, local store downtown or you own the largest jewelry store in Southern California, business security will help. Internal and external shrink are both large problems for retail stores, and a business security camera can deter both — and document break-ins when they occur. It’s safe to assume that banks already have business security in place, but that doesn’t mean the coverage can’t be improved. An LTS security system could be a wonderful addition to ensure protection, documentation, and evidence. While many banks already have office surveillance and potentially even security guards, another camera or two in concealed areas could be beneficial. By installing business security in warehouses, you can increase safety and decrease the risk of threat. An LTS security camera system can quickly show if an accident happens and an employee as at risk. On top of this, warehouses can actually serve as an excellent location for theft — there often aren’t many people working and there is a lot of inventory. A surveillance video recorder can help catch the perpetrator. Is your business on this list? Reach out to Dutale Inc. today to find out how our camera systems can help and to get a free quote today. Here in Moreno Valley, we’re committed to the success of our clients’ businesses — let us improve the business security of yours today.